Home » Community and Society » Editorial: Police have the “smoking gun” on McAfee; so why no charges? Newer: » The San Pedro Sun welcomes a new team member: Meet Janelle Cowo! John McAfee, the on-the-run from the police/anti computer-virus pioneer has swallowed the attention of the local and international press, but in Belize he is simply wanted by authorities for “questioning” in the murder of his neighbor, Gregory Faull. Faull was found dead on the morning of November 11th, but according to Police Press Officer Raphael Martinez, until McAfee can be questioned, the murder investigation has “stalled”. With police claiming that he might be able to shine some light on to the investigation, the calculating and media savvy McAfee gave Belize the slip and fled to Guatemala well over a week ago. Now headed to the US, we may have lost the chance to bring McAfee in for questioning. One has to wonder why it was so hard to locate the man when all the while he claimed to be in Belize, with rumors of him even being at his house here on the island. As local authorities claimed they were scrambling to solve the murder of Faull, islanders, as well as “people in the know” accused the Police Department of “dragging their feet,” not only slow in solving the crime but in locating McAfee. Some claim that the “good relationship” McAfee maintained with some of the senior officers within the Belize Police Department resulted in a half-hearted attempt to bring him in. It seems to me that the one way the police could have heightened his status from “wanted for questioning” to charges of “Kept Firearm and Ammunition without a License” was completely dismissed. With the new amendments to the Firearm Act that came into effect in 2012, police are now tasked to charge “everyone and anyone found in a particular house when a firearm is found when they are not authorized to have it”. In addition, there have been several cases when the property owners were not present, and even though he or she was not at home at the time of the search, were sought and charged with “Kept Firearm and Ammunition without a License”. 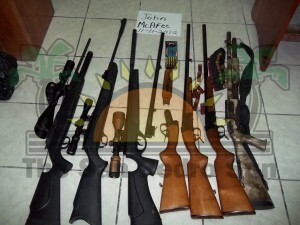 1) On April 17, 2012 police arrested and charged five men for firearm offences after they conducted an operation and searched a Peter Seco Street address and found one .410 gauge double barrel shotgun, one single action 16 gauge shotgun and two 16 gauge cartridges. While one of the men, Kent Lynch pleaded guilty and was sentenced to 13 years and 6 months in prison, his mother 52 year-old Yvette Lynch as arraigned before Magistrate Hettie Mae Stuart. She was charged with the same fire arm offenses, and she was remanded to prison until May 17th. It is important to note that she was not present at the time of the search, but because it is her house, she was also charged and remanded to prison. 2) On April 27, 2012 Belize City Police arrested and charged three people for gun offences, one of whom was Nurse Judith Rocke. Rocke told Senior Magistrate Sharon Frazer that she was at work and was not at home when the gun was found. Senior Magistrate Frazer told her that there is nothing that the court can do because of the law, and as a result, the judge remanded her to prison until June 8th. There were guns found on McAfee’s property. Guns that were A) not licensed to him, B) the individuals who held the licenses were not on the premise and C) McAfee did not have the special permission required by law to have these weapons on his property. As far I can tell this adds up to one heck of a gun offense in Belize. If indeed the Belizean police were convinced that McAfee may hold the key to this murder mystery, they could have detained him for these gun violations while continuing their quest in finding answers related to the Faull murder. These charges could have been their “smoking gun” in aggressively locating and arresting McAfee, who is apparently in violation of the law. The BIG question here is WHY was McAfee not charged for gun offenses? The Thursday prior to the unfolding of Faull’s murder, on November 8th, McAfee donated a substantial amount of equipment to the local police department on the island. At the event he also offered to house five new officers that had just arrived to San Pedro Town; the offer was not accepted by the local authorities, given his previous conflicts with the police and it could have been perceived as a case of “personal interest,” on McAfee’s part. McAfee admitted on his blog that “it was not easy to exit Belize and required many supporters in many countries.” McAfee fled to Guatemala through the western section of Belize, passing four permanent police checkpoints along the George Price Highway. How was it possible for McAfee, his girlfriend and a team of reporters, to freely move out of Belize without being caught? Now, if McAfee and his entourage passed to Guatemala via boat as pirates of the Caribbean there is little policing done of these bordering waters. We have heard senior officers cautiously hinting that some members of the police may have known where McAfee was all along but were protecting him because of their affiliation with him. “Some of our Senior Officers are known and have been seen, wining and dining with Mr. McAfee in the past. He has hosted them at his house,” said a Senior Officer within the Belize Police Department who asked to remain anonymous. I can think of a few reasons why the police have not pressed gun charges against McAfee, A) they don’t have enough evidence against him in the murder to make it worth while hunting him down on gun charges, B) they just want to be done with the man or C) he has friends in high places that are making sure the charges don’t happen. Unfortunately until those charges are made, Mr. McAfee has gotten off on an offense that has sent many Belizean individuals to jail. While McAfee has managed to garner global attention the truth of the matter is that Gregg Faull was murdered on Ambergris Caye. It appears as if the police are unclear in the course of the investigation of the murder case and have been very tight-lipped during the course of the investigation. More importantly, they have not stated how pivotal McAfee’s statement is to Faull’s murder investigation. While Belize does not have an extradition treaty with Guatemala, they certainly do with the US and the possibility of returning McAfee to Belize could happen…if he was a WANTED man. “I see the murder investigation stalling for a little while but I don’t see it falling apart,” stated Martinez when questioned what would happen if they are unable to question McAfee.